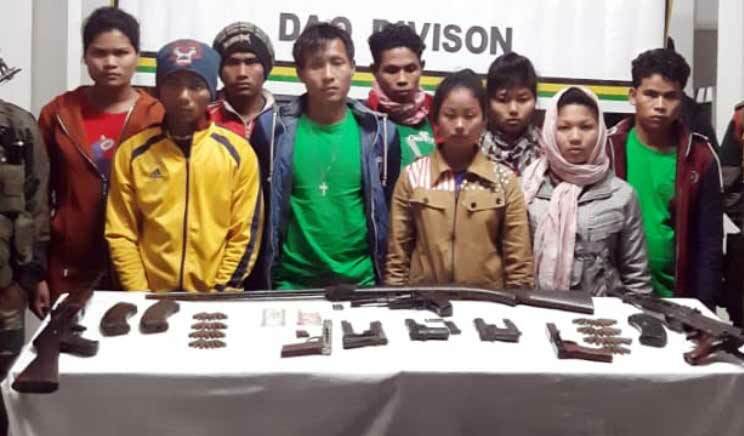 9 NDFB ( S ) cadres apprehended in a Joint operation of Army and Arunachal Police along Myanmar border in Jairampur area of Changlang district. Intelligence was collaborated over the period of time with ground sources for the last two months on infiltration of NDFB(S) cadres from their training camps at Myanmar towards own side for attempting and carrying out subversive activities. An efficacious joint operation was launched by Army of Red Horns Division, Dao Division, Assam Rifles and Jairampur police on the night of 02nd of December and resulted in apprehension of 9 insurgents of NDFB(S). Details of apprehended Myanmar trained NDFB(S) cadres belonging to Batch -42 are as follows. The complete group was busted while infiltrating into India from their training camp in Myanmar. An Ambush was established on their infiltration route and all Nine (9) Cadres were nabbed. The Operation also resulted in recovery of 9 weapon incl AK -47, AK- 56, Pistols and various other ammunitions. The cadres along with seized items are being handed over to police. The joint operation is an excellent example of high level of coordination and cooperation between different security forces and also exhibits dogged determination of Army to quell insurgency and maintain peace and harmony in the region.